Adding your logo to Patagonia vests and jackets means your brand goes wherever your employees (or clients) go. Our guide to promotional Patagonia gear will help you choose the best options for your team. If you are in the market for fashionable and functional outdoor apparel, then chances are that you have heard of Patagonia. The California-based clothing company is well known for its comfortable, often polyester-fleece designs. Its line of clothing is as warm as it is stylish. 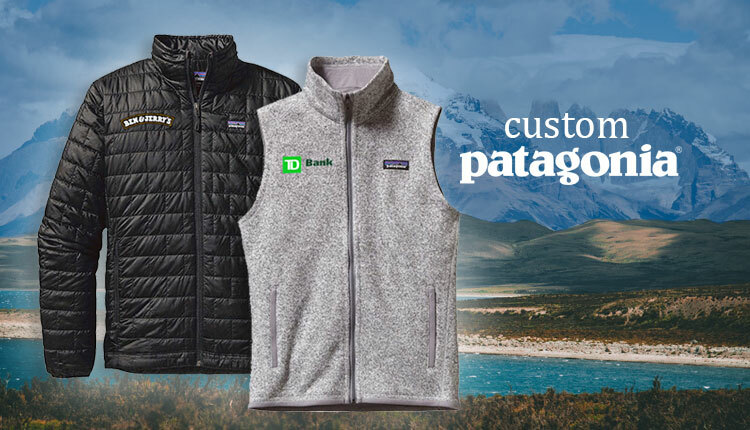 You might not have been aware that you can actually get custom Patagonia apparel with your company’s unique branding. This is a great way to leverage the iconic logo and quality products of a major brand while also improving your company’s reputation. But, do consumers actually view Patagonia favorably? According to a 2019 Axios Harris Poll survey, the company is the third most well-liked company in the United States behind only Wegmans and Amazon. So, adding your name to a brand with that kind of stature is a fairly safe bet. You may be wondering why Patagonia has such a high-quality reputation. After all, there are many outdoor clothing companies to choose from. Why does Patagonia seem to outpace them all in terms of likability? Let’s first take a look at why they are such an important brand to leverage. Patagonia was founded in 1973 by Yvon Chouinard. Yvon was a seasoned rock climber who immediately lent legitimacy to the brand at its outset. From the beginning, the brand had a focus on conservation and sustainability. In fact, 1% of all sales of Patagonia products is donated to environmental causes. Of course, the company has made a bevy of other eco-friendly marketing decisions. In 2011, it ran a full-page ad in The New York Times instructing readers to not buy one of their most popular jackets because of the substantial environmental toll of making them. Ironically. The company saw a roughly $10-million boost in sales, much of which was donated to charities focusing on environmental causes. In recent years, the company has gotten explicitly political. It even went as far as suing the United States government after it announced it would be reducing the land size of two prominent National Monuments. But, what does all this mean for you and your company? Regardless of your political persuasion, there is a noticeable shift in consumer habits. People (particularly millennials) want to feel as if they are supporting something larger than just an apparel company. They want to feel as if they are making a difference. A 2018 Nielsen study revealed that 81% of individuals felt as if companies should be actively working toward improving environmental conditions. Additionally, people are more likely to pay for products and services at a company that is striving to have a positive environmental impact. Attaching your name to custom Patagonia apparel is a great way to signify that you are a company with lofty aspirations. Beyond that, Patagonia is known for its quality and durability. Whether you give this Patagonia garb to employees or clients, you will forever be associated with someone’s favorite jacket, sweater, or vest. Now that you know why Patagonia is such a popular company, let’s take a look at some of the company’s great apparel options at iPromo. The custom Patagonia quarter zip sweater is an instant classic. As the name suggests, the sweater is a pullover that zips down the front about a quarter of the way. It is composed of a combination of wool and polyester fleece that is both comfortable to the touch and aesthetically stylish. A warm stand-up collar and raglan sleeves only increase the sweater’s coziness. The men’s version of the custom Patagonia quarter zip comes with a zippered left chest pocket. The women’s version has a zippered pocket on the left sleeve. It also comes in a variety of colors, including stonewash, navy, and black for men and birch white, navy, black, and “pelican” for women. Again, these sweaters are designed for lengthy use in outdoor weather of all varieties. They are also just functional and elegant, allowing them to be worn from the board room to the hiking trail. Custom Patagonia vests have become a major fashion statement among business elites throughout the country. The Wall Street Journal called it the “new corporate uniform.” The vest is similar to the sweater, except that there are no sleeves and there is a zipper running the length of the front section. These vests are routinely worn over collared dress shirts, which is the perfect business casual look for any working professional. Both the men’s and women’s iterations of the vest come with two “hand-warmer” pockets in the front. The men’s version has another zippered pocket on the left chest area. The reason these vests are so popular is because they provide the warmth of any other custom Patagonia apparel. This includes more mobility and breathability for your arms. You will never have any issues reaching or stretching out with a Patagonia vest. You also won’t have any problem looking stylish and feeling cozy all at the same time. These custom Patagonia sweater jackets are essentially a step-up from the quarter zip sweaters we discussed above. The main difference here is that the sweater jackets have full-zip functionality. This gives you the ability to “air out” so to speak while still looking as classy as ever. Again, polyester fleece is the material and there is a stand-up collar around the neckline. The men’s version has two hand-warmer pockets and a left chest zippered pocket in the front. The women’s version also has two hand-warmer pockets, but, instead of a zippered pocket, it has two interior drop-in pockets. All the hallmarks of custom Patagonia apparel are here again. Warmth, comfort, and aesthetics combine to make an unforgettable sweater. In the winter and fall, this is the type of sweater that gets a lot of wear and tear. It also gets your brand quite a few impressions in the process. These jackets are noted for their supreme warmth and lightweight design. In fact, the material is generally very compressible, making it easy to pack in a suitcase. This is ideal for when you are heading out on a business trip and want to be prepared for colder weather. The jackets are also windproof and waterproof, maintaining around 98% of their warmth even when they are wet. The Nano Puff jacket vests are essentially identical to the actual Nano Puff jackets except that there are, again, no sleeves. These are great for when you want to feel warm in cold weather while also maintaining mobility once you get to the office. A Nano Puff vest is also quite the fashion statement. The vest comes with a center-front zipper, hand-warmer pockets, interior chest pocket, and an adjustable draw-cord to help maintain warmth. There is no designated women’s version of this design, but it can still be a great method to reward employees or clients and get a little free advertising in the process. That versatility can come in handy, particularly for people who enjoy a wide range of different activities. You can use it as a briefcase on your way to and from work and then just shift it into a backpack for a nice weekend hike. This bag can hold any number of items in a variety of ways, to be sure. It is also made of 100% nylon, half of which is recycled. There is also a 15-inch laptop sleeve which can accommodate most smaller laptops produced today. Your logo would also feature prominently on the bag’s large back panel. This ensures it will be hard to miss. It’s hard to find a more functional and aesthetically-pleasing apparel company. It’s part of the reason why Patagonia has the third best reputation among all American companies. Of course, the other reason is its commitment to environmental causes. This is a fact that a majority of consumers will enjoy. If you are looking for to start a custom Patagonia apparel promotional campaign, then you have come to the right place. Shoot us a message today so that we can start the process of getting your company’s logo on Patagonia apparel.